I am asking everyone I meet what makes them happy. Now, I am starting my own list and I will begin with a place. My family is from Brittany in the west part of France. 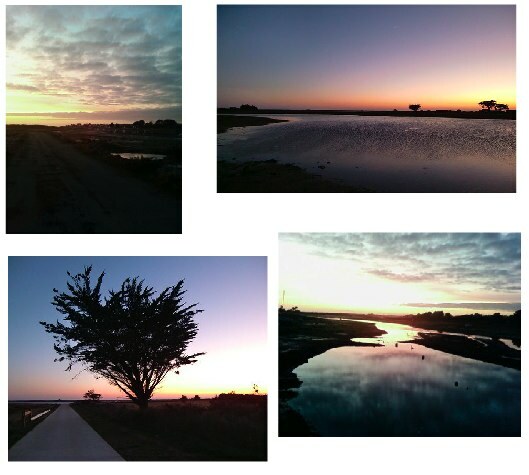 When I go back, about 3 times a year, there is a place where I love to go for a walk at sunset: Kerner peninsula. It’s a 1 minute walk from my mother’s house and right away, the color of the sky reflecting in the water is a candy for the eyes. Add to it, the seagulls dancing in the sky, the water clapping, the wind tickling, trees playing chinese shadows and you are looking at pure beauty. Every night is a new show and a happiness boost.